I think it is very interesting to see how much of the Textile and Apparel manufacturing and economics are based on politics. So much of it is trade politics and the T&A industry in one country can be so greatly affected by the TPP, NAFTA, CAFTA, etc. Each country really has to push their own agenda, for example the U.S and the Yarn Forward Initiative, in order to improve the industry, or even stay afloat. This really stuck out to me in this article as being quite interesting. My understanding of TPP is that it is of course meant to impact trade patterns, but I was also under the impression that it was meant to do this exactly; promote the investment in TPP partners. I thought that this was one of the aims of the policy in order to further develop other countries and create alliances between countries, etc. If in reality only 10% end up investing more in TPP partners, then I think that would be a miss for the policy. great comment! Actually this result is a little surprising to me as well. 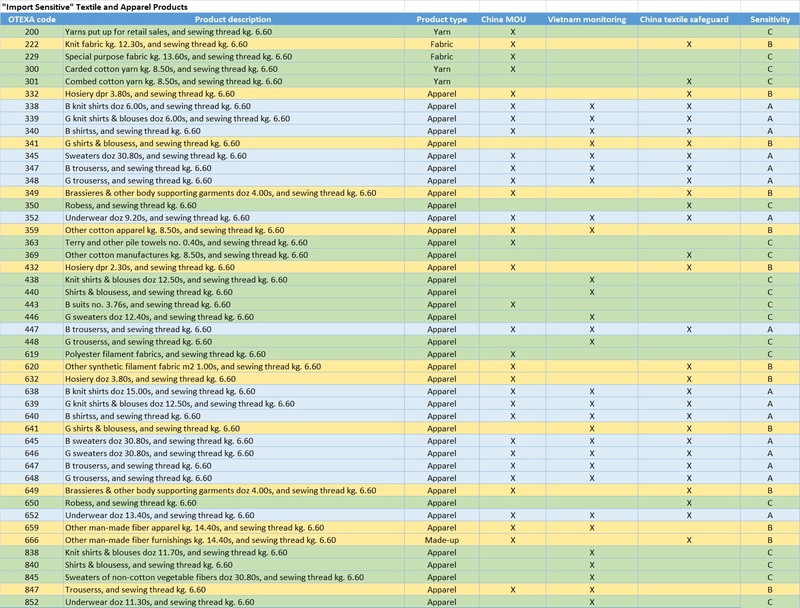 A possible reason is that there were still many uncertainties about TPP when the survey was conducted (March-April 2015)–the TPP negotiation was still going on, the important legislation (Trade promotion authority bill) was still pending… so reasonably companies were not in the mood to commit to long-term investment in the TPP region. But since TPP now has concluded, maybe companies are changing their mind. 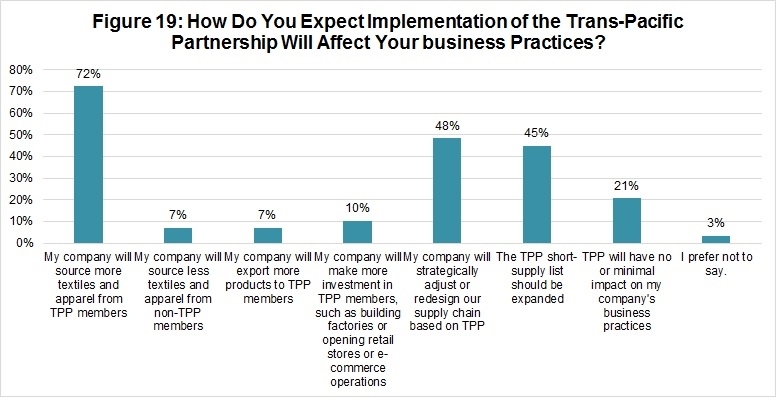 We will continue to investigate the long-term impact of TPP in next year’s survey. This quote taken directly from the blog post is shocking to me. After all of the information we have gathered through our studies this semester about the TPP, as well as the information expressed and relayed to our class by our guest speakers, it still comes as such a surprise to hear startling statistics such as this. The connotation throughout this entire post is extremely negative towards the TPP, where as Matt Priest when discussing the agreement with us made his positive opinions towards the agreement very clear. Although the agreement has developed more since this post was written, why does the United states want to continue with this agreement if any of the above information could prove to be true? Figure 19’s statistic about how 21% of companies do not expect any changes in their manufacturing and importing and exporting is quite surprising because I personally thought that it was quite high. And I also wonder why these companies think that way. Is it because they do not use TPP members? Otherwise I feel that there is a significant amount of companies that don’t use TPP members which is also very surprising. I never realized just how much politics comes in to play! 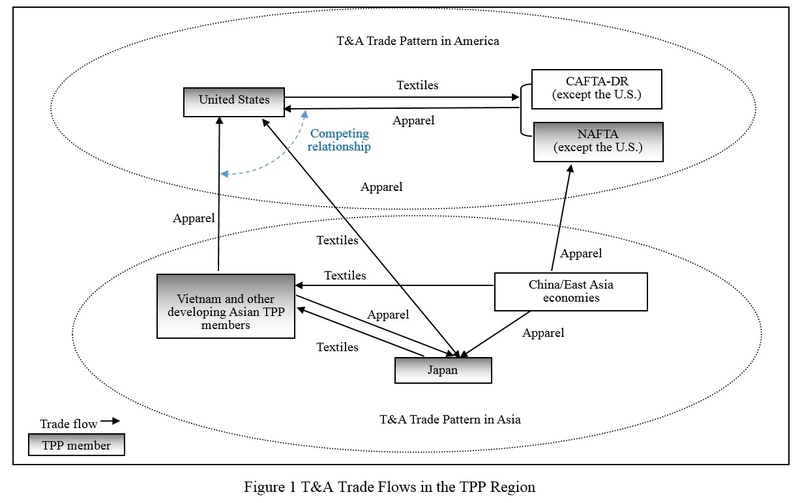 After reading this article, I am still questioning why TPP is still a consideration of the T&A industry. It seems as though it is very controversial and may not benefit as much as much as we think. Why are we still pushing for TPP? Do we think that the addition of yarn-forward RoO will really be of benefit? After reading this article I am thinking otherwise.